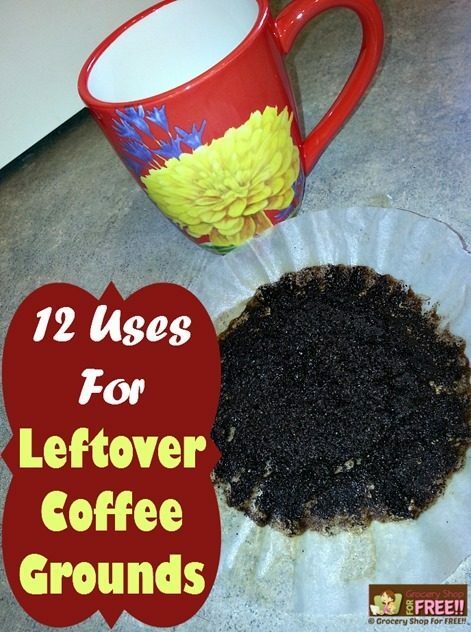 12 Uses For Leftover Coffee Grounds! If there is one thing in my house I use on a regular basis and can always count on having on hand… it would be leftover coffee grounds! Every day I have at least 2 cups of coffee, as does Hubby, so we have leftover grounds and we just toss them, but there are so many uses for them! From facial scrubs to cleaning out the fireplace there are so many things they can be used for it’s unbelievable! I love when I can find other uses for things we use every day or have on hand all the time! Do you have any ideas for reusing things or using things most of us have on hand all of the time in a different way? I am not an “out of the box” thinker, so I love to hear other people’s ideas who are! I thought I would research some ways to use them and share them with you! Place an open container of leftover grounds in your fridge or freezer to neutralize odors! No need to buy boxes of baking powder for that job anymore! Use a damp cotton swab, dip into leftover grounds and use to minimize the look of scratches and in wood. Be sure to test a hidden spot before you do it to make sure you get the desired color. Use leftover grounds in the garden to discourage bugs from getting to your plants and destroying them. Use damp leftover grounds to help keep down the dust when cleaning out the fireplace. Just toss them on the ashes before you remove them. Place an open container with leftover grounds in a room or car that needs deodorizing. Use leftover grounds to deter cats from using your garden as a litter box. Fertilize your garden and potted plants by adding leftover grounds to the soil or to your watering can. Repel mosquitos by placing dry leftover coffee grounds in an aluminum pie pan, add a couple (do not soak) of drops of lighter fluid, carefully light the grounds and the smoke produced will ward off mosquito! Add leftover grounds to your facial or body scrub for extra exfoliation. Leftover grounds make a great abrasive cleanser for cleaning pots and pans. Use leftover grounds as a hand cleaner to get rid of cooking smells on your hands such as onions. Put leftover grounds in old hosiery or cheesecloth to make sachets you can place in closets and drawers to absorb odors. What are your tips for Leftover Coffee Grounds? Share them in the comment section! 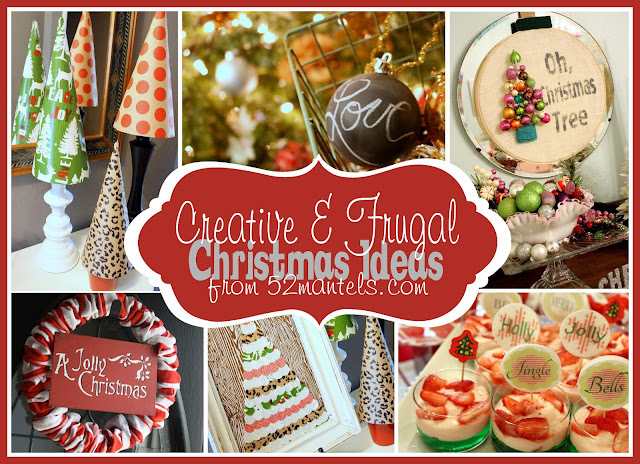 Creative & Frugal Christmas Ideas! 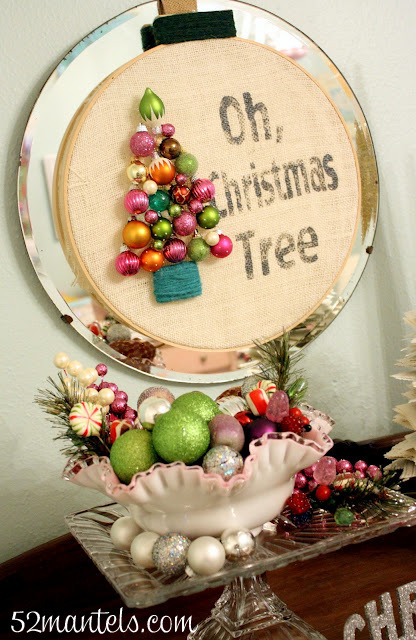 Creative & Frugal Christmas Ideas! Emily from 52 Mantels is back! I love it when she is able to contribute crafts for the site! She makes the best stuff, they are adorable and she makes it so easy to do! Her own home is filled with these wonderful things she makes. I’ll share a secret with you. Emily was my DD’s BFF growing up, and she was one of the teens in our youth group, too. We always knew she had this penchant for crafting, she got it from her mother Susan over at Permanent Posies who shares wonderful recipes with us! 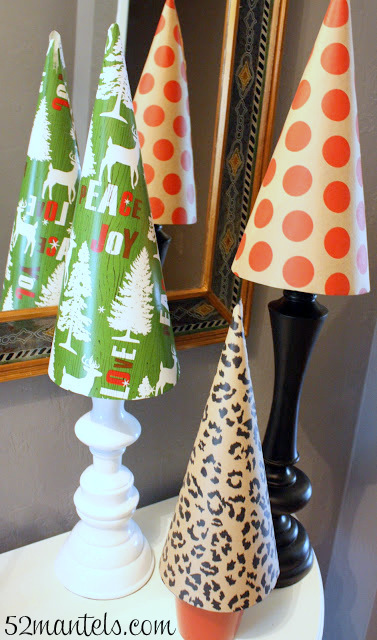 This is a wonderful round-up of past frugal Christmas Crafts she has done – in the coming weeks she will be guest posting with fun Holiday craft tutorials for us to get ready for the holidays! Christmas is my most favorite time of year! And, it’s the perfect time to do a little crafting. Bringing Christmas cheer to your house doesn’t have to cost a lot of money! These Creative & Frugal Christmas Ideas were all made using supplies around the house and a few dollar store purchases. Easy and inexpensive as most of the supplies can be picked up at Dollar Tree! To make these Wrapping Paper Christmas Topiaries, I simply shopped my house and Christmas supplies! 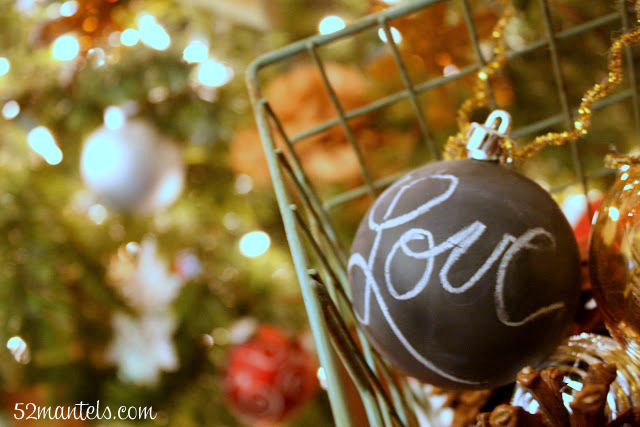 Cheap ornaments and chalkboard paint created easy and inexpensive DIY Chalkboard Ornaments! I love decorating every room in my house around Christmas, including my daughter’s room. This Oh, Christmas Tree Wreath was made with extra ornaments and an embroidery hoop and added some fun charm to her sweet nursery! 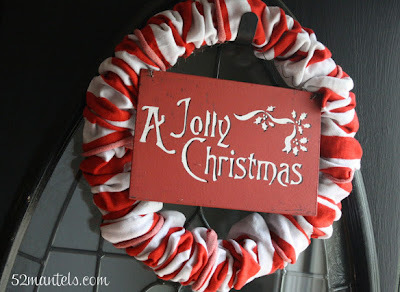 Striped socks and a dollar store wreath make for one very cute So-Simple Sock Christmas Wreath! Who doesn’t love easy art? 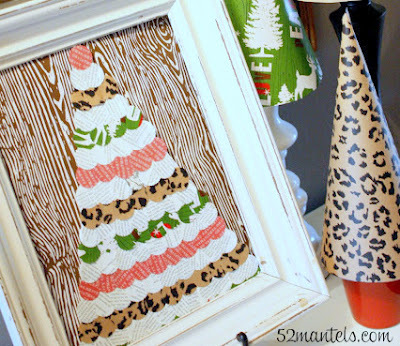 This Wrapping Paper Christmas Tree Art was made using Christmas wrapping paper and a decorative circle punch. I love that this tree can be completely customized to any color scheme! 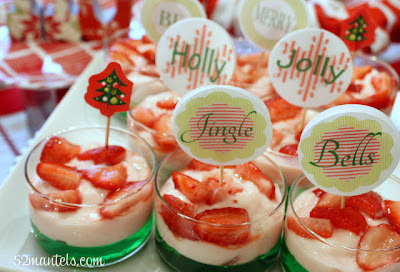 Jello, yogurt and strawberries come together in this cute and kid-friendly Merry Christmas Parfait. Pair them with FREE PRINTABLE toppers and you’ve got yourself an easy, festive party dish! Follow the links to get the full tutorial for each of these craft projects! Hi! I’m Emily from 52 Mantels, a blog about all things home including weekly mantel makeovers, easy DIY projects, seasonal crafts and simple recipes! I’m blessed to be the stay-at-home mother to one adorable little girl and the lucky wife to an ever-supportive hubby (who puts up with my endless projects!). Over the years I have run across quite a few “kitchen hacks” that helped me and so I thought I would share them with you! I love finding these – it’s fun for me – so excuse me while i get happy about them! Finding a new or easier way to do things in the kitchen make me so happy. I love when you can use something differently or substitute something. 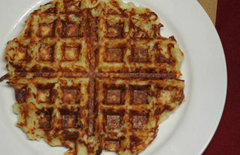 I love new solutions and ideas to make things easier in the kitchen. Whether it’s cooking or cleaning or organizing, I am happy to try it out! 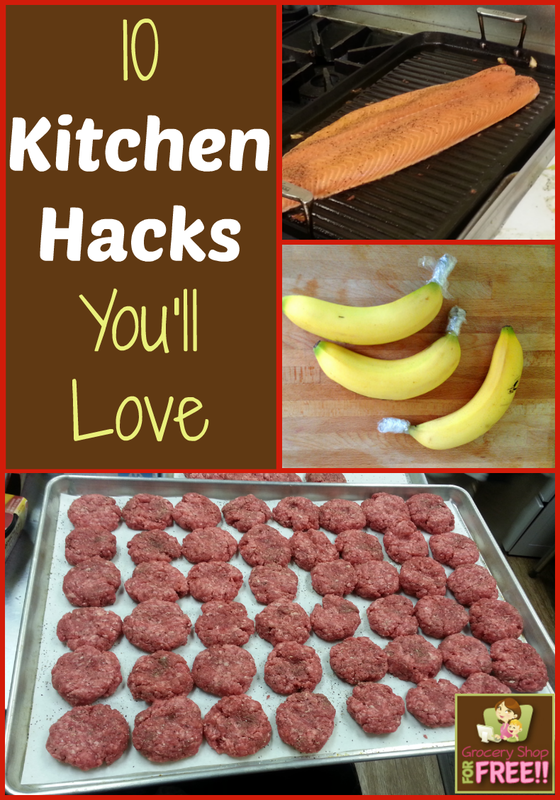 I am hoping that y’all have some kitchen hacks to share with me, as well. Any little bit of help to make clean up easier, cooking faster, or life in the kitchen more simple is definitely a plus! Especially if it gets me in and out of the kitchen faster! So, please share any fun tips you have come across in your experiences! Ripen an avocado quickly place it in a paper bag with a banana on top of the fridge for a day. Keep potatoes from budding while being stored by putting an apple in the bag with the potatoes. Cook burgers evenly by putting a thumbprint in the middle of them before cooking. Perfect microwave leftovers every time. Put a couple of drops of water on your leftovers and cover them (I use a bowl when heating a plateful of food, making sure to cover all of the food), place them in the microwave for 1 minute on high. When you remove the cover (carefully there will be steam) you’ll have perfectly heated and moist leftovers ready to eat! What are some of YOUR kitchen hacks?